THERE’S a new superhero on the block this fall, and she might just have the strength (or as she would most likely say, the “fortitude”) to render a big vocabulary cool among schoolchildren. The weapon of choice for PBS’s new “WordGirl” is words: the more expressive, the better. 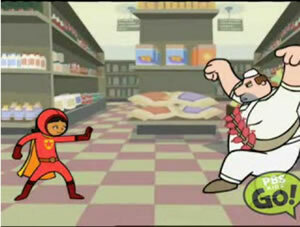 When the fifth-grader Becky Botsford dons her red cape and spits out mouthfuls like “preposterous” and “bicker” and “cumbersome,” her enemies — from the often-tongue-tied Chuck the Evil Sandwich-Making Guy (whose name is a chance for WordGirl to define “absurd”) to the Butcher, who mangles words while hoarding meat — capitulate. Many of the actors who voice the characters come from the improv comedy world, and riffing was encouraged during taping sessions; occasional crackups audible on the soundtrack are infectious. The cast includes Jeffrey Tambor (“Arrested Development”) as Mr. Big; Fred Stoller (“Everybody Loves Raymond”) as Chuck the Evil Sandwich-Making Guy; Tom Kenny (best known as the voice of SpongeBob SquarePants on Nickelodeon) as Dr. Two-Brains; Ryan Raddatz as Todd Ming, better known as Scoops, Becky’s fellow reporter at the school newspaper; and, as the heroine, Dannah Feinglass, a former cast member of “Mad TV” on Fox. The quality of the jokes aside, it seems that WordGirl teaches vocabulary mainly by correcting other people's word choices, or using (and condescending to explain) a rare and formal word when a commoner and less pretentious one would have worked just as well. This reinforces the idea that knowledge serves mainly to one-up or impress other people. It also reinforces the idea that intellectuals are snarky and obnoxious. I have particular affection for this series because it provided laughs to me and others throughout July's TV critics press tour. Whenever a questioner or the person answering a question mangled the English language during a press conference, my buddy and fellow critic would lean over and say, "We need WordGirl!" Given that pre-adolescents are traditionally in search of ways to feel superior to adults -- not that they ever need to look very far -- perhaps exactly what the nation needs these days is a role model to inspire more fifth graders to become snarky and obnoxious by using big words and correcting the usage of others. I think the idea, though, is just to use the snark as a way to sugar-coat the pill of vocabulary enrichment, not to turn out a whole generation of David Foster Wallaces. But children's shows are inevitably about symbols of identity as well as about transmission of literal content. (I don't think it's an accident that the generation who grew up with the multicolored fur of the Sesame Street puppets took to dying their hair orange and green and purple in college.) And from the point of view of identity symbols, the role of gender and class in WordGirl also deserves a comment. WordGirl is presented as the champion of English as a literary language. Her super-enemies are almost all adult males, including especially The Butcher, complete with deep voice, five-o'clock shadow, male pattern baldness, and stereotypical working-class accent. (The Butcher's superpower apparently involves forcing opponents to eat too much meat, but that's a topic for another post.) So I wonder: how long will it take, after the pilot airs at 4:30 this afternoon, before the first schoolboy with an interest in reading and writing is nicknamed "WordGirl" by his classmates? My bet is on the morning recess at school tomorrow, in those areas where the schools are already in session. Maybe the show's creators have a plan for dealing with this issue, I don't know. But on the face of it, the clips posted to YouTube suggest that this show could have a large and negative impact on the educational gender gap. I've been vocally skeptical about the genetic and neurological basis that some have claimed for this problem; and it remains unclear whether the problem is that boys are doing worse, or that girls are doing better. But the gap is real, and the way to improve things may not be to associate vocabulary improvement with a 5th-grade female superhero correcting the English of adult male villains. The show's regular slot will be 3:30 p.m. on Fridays and 10 a.m. on Sundays. [If it's not clear to you why WordGirl is any way problematic, try to imagine the reaction to a show where MathBoy defends the world against villains like Ms. BadAd, a PR consultant who doesn't understand percentages, and CheckoutGirl, who is too dim to make change correctly. Apparently a female villain, "Lady Redundant Woman", is due to appear in a WordGirl episode next spring -- though her fault, I imagine, will be to use too many words. And according to the wikipedia entry, two of the 30 WordGirl shorts (shown on PBS Kids GO! last fall) featured the villain Granny May, although neither of these appears to be on YouTube -- and it's not clear that Granny has any vocabulary problems. The WordGirl web site identifies her as "a mean, grumpy criminal ... [who] plays the role of a feeble, kindly, hard-of-hearing grandma in order to deceive the city and rob everyone blind". In the first part, Spell Binder sneaks into Letterman's home in order to exact revenge for being foiled, time and time again. He spies upon Letterman, who happens to be packing away all of his letters into a trunk as he prepares to go on vacation. Spell Binder changes the "trunk" into "junk," then proceeds to shrink Letterman down to six inches tall by changing "junk" into "shrunk." However, Letterman then changes "shrunk" into "hunk," which restores his college-football-player physique. He then proceeds to bend Spell Binder's wand, rendering it useless. In the second part, Spell Binder has been placed behind bars. The narrator of the episode declares, "This looks like the end of a fiend," which inspires Spell Binder to use his bent wand as a letter "r" to change "fiend" into "friend." A strange-looking monster appears (as the narrator exclaims, "I didn't know he had any friends!") and bends the bars of Spell Binder's prison cell, allowing him to slip out and escape. Dennis the Menace's Margaret. Lucy Van Pelt. That's the image these people are setting up, and considering the background of these writers, I can only think they're doing it on purpose. How long before we're back to Philip Wylie's sexist screed "Generation of Vipers"? I remember wanting to use exactly the right word to express myself, and being told I should use "easier" ones so people would know what I was talking about--never mind that I would no longer really be saying what I meant. If this show in any way makes it "cool" or even just "acceptable" for kids to use the words they know than I'll be happy.